The Local Server Panel controls all aspects of playing on a local server. When you first start XPilot5, the Simple Panel (on the left) is displayed. This panel contains the minimum commands neccessary to play XPilot on your own computer. Start server Press this button to start your XPilot server. The server is started on 127.0.0.1 port 15345 and any other IP/port combinations that you configure. When the server is running, this button will change to "Stop Server", and the text widget will display the name of the map that is running. Play Game Launch the client and connect to your server running on 127.0.0.1 port 15345. 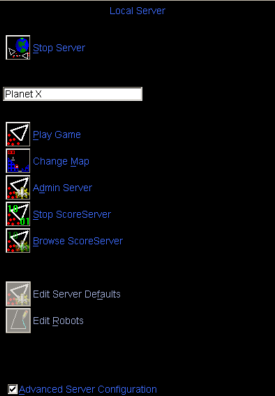 You should now find yourself playing XPilot. Change Map Perhaps you are bored by the "Hello World" map. Click the Change Map button to bring up the File Chooser to select a different map. Note that you have to restart your server (stop it then start it) after you select a map. If you check the Advanced Server Configuration checkbox, then you will be given the additional options as shown in the Advanced Panel, above right. Admin Server Opens a window and connects a Server Control to your server. From that control, you can change most of the 300+ options that configure your server. This button is not available, greyed out, if your server is not running. Start ScoreServer Starts the ScoreServer on your local machine on 127.0.0.1 port 15346 and any other IP/port configuration you have specified. 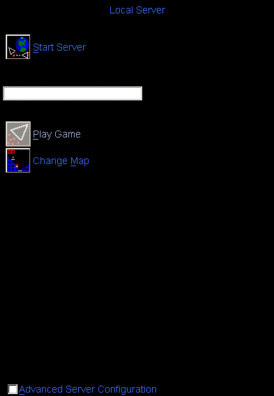 Browse ScoreServer Opens your browser and connects to 127.0.0.1 port 15346. This is considered a privileged connection (being that it comes from the localhost) and allows you to configure the ScoreServer as well as browse it's data.